Sepsis is a serious bloodstream infection. It kills more people than breast cancer, lung cancer, and prostate cancer combined. It affects around 26 million people a year and is notoriously difficult and expensive to treat. Sepsis is a worldwide problem crying out for a solution that tackles both the high morbidity rate and the high cost of treatment and this is exactly what fledgling Irish medtech company, Cala Medical, has come up with. The company’s novel solution focuses on fighting the sepsis from within via the body’s immune system. It works in a similar manner to kidney dialysis by passing the patient’s blood through a hand-sized unit (outside the body) where it is treated with an enzyme that targets a blood protein called C5a. In healthy people, C5a goes quietly about its business causing no problems. In those with sepsis, the protein goes right out of control and creates a potentially fatal massive cellular response (known as a cytokine storm), that can ultimately lead to multi-organ failure and decreased survival rates for patients. Central to the development of Cala Medical’s innovative treatment is the expertise of two of its co-founders, Jakki Cooney and Todd Kagawa, who between them have spent some 50 years studying blood protein structure and expression. 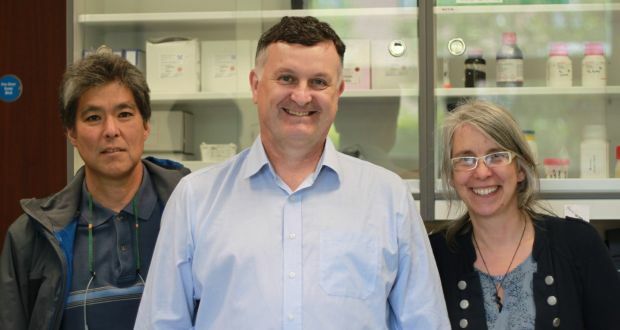 “Jakki and Todd have worked together on and off for many years and their research into the unusual properties of the ScpA enzyme and its possible use in treating human disease led us to make an application to Enterprise Ireland for a commercialisation fund grant in 2013,” explains Cala’s third co-founder and chief executive, Brian Noonan. Both Noonan and Cooney hold PhDs in microbiology while Kagawa has a Ph.D. in biophysics and biochemistry. Prior to setting up Cala Medical, Noonan was part of the management team at pharmaceuticals giant AstraZeneca’s US operations and he brings extensive expertise in commercialisation and managing R&D collaborations across the US, Europe, India, Australia and Asia to the project. “Currently there is no effective treatment for sepsis and ours is the first device to target a key immune mediator that will reduce the damage caused by the out of control inflammatory cytokines are typically seen in sepsis patients,” he explains. “The key to unlocking its potential was Jakki and Todd’s understanding of the enzyme and how it acted on this particular protein. Our device treats a patient’s blood with this potent and highly specific enzyme which renders C5a inactive and our solution works in conjunction with the traditional treatments for sepsis that usually comprise IV fluids, antibiotics, and ICU care. “There are no equivalent therapies to ours on the market today. Cassettes that filter blood are available but they are not widely used due to limited success in treating sepsis. There are other companies pursuing therapies using extracorporeal cassettes, but these are based on cleaning or removing substances, such as bacterial material, from the blood. Our system is the only one adding something that specifically targets the human immune system and reduces the over-response no matter what the cause,” Noonan says. Cala Medical is a spin out from the University of Limerick and the company, which was formed in February this year, is based at the Nexus Innovation Centre there. The founders, who have licensed the IP from the university, have been working on the project for the past three years and Noonan and Kagawa now work full time in the business. The company will begin hiring soon and expects to have 12 people employed in scientific, clinical/regulatory and business development roles within the next 18 months. Investment to date has been in the form of a seed round of €850,000 which came from founder investment and Enterprise Ireland’s commercialisation fund. A second round raised a further €500,000 from angel investors and Enterprise Ireland’s high potential start-up fund. In the coming months, the company will begin the third funding round to secure between €1.5 and €2m to see the device through to clinical trials and regulatory and compliance requirements for both Europe and the US. The company’s initial target market is the EU with the US to follow and its preferred route to market will be through an existing supplier of equipment to critical-care units. “Our vision is to have this therapy available in every ICU all over the world,” Noonan says. Indeed, the company’s clinical trials are not scheduled to begin for another two years. “There is a great deal of pre-clinical trial testing to be done around proving the concept and testing the device to ensure its safety and efficacy with human blood samples before you can even begin,” Noonan says.